Morning: I spent the morning sort of putsying around on the computer and making my lists… didn’t head out to do the shopping for it until about noon. 12:00 noon: Living in Japan, I had to eliminate a fair number of potential recipes, and then go to three different stores to get my list. (The first two stores, believe it or not, did not have bell peppers. Well, the second store had two small yellow ones – $2.00 each!). 2:00 pm: I came home and began organizing the space. I put all the meat on one counter, all the veggies on another, and my herbs and spices in front of me as I started cutting meat. Eric and I decided it would be totally easier in the U.S., where meats are more prepared for you. Here, I had to take the skin off of all the chicken, cut up slabs of meat into stew meat, make my own chicken broth, etc. 3:00 pm – Kids came home from school and looked at mom like I was crazy! Kitchen total disaster. 5:45 pm – Got the last set of chicken breasts into the bag with all of its accompaniments. Here are the dishes that I made. You can find a good assortment of options and recipes here and here and here….I copied a bunch of recipes into a Word document, then went thru it today and printed off the ones that I thought were doable based on the ingredients i could get today. 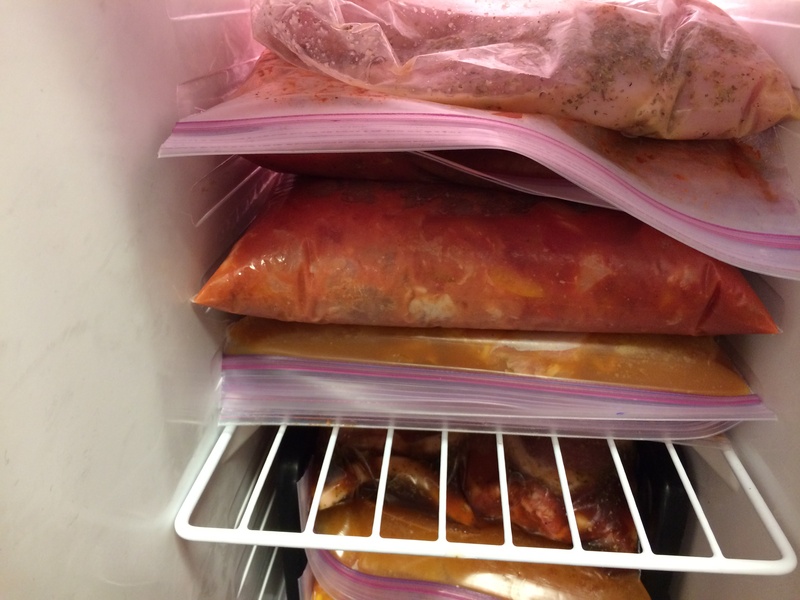 Here is a link to the Freezer Crockpot Meals that you can use to choose your own! My general sense is that you can adapt any of your favorite crock pot meals and put them in the freezer. I even made one with cream cheese in it (Italian cheese chicken). For mushrooms, the best advice that I found was to fry them up in butter and freeze them separately in small baggies, then add when you start the crockpot. One thing that I found was that it was the meat that took the most time to prepare. If I don’t have as much time in the future, I think I would at least prepare a bunch of meat – that is often the biggest battle in getting a meal going (again moreso because we live in Japan). I’m excited to have meals ready for this next month! Let me know if you try it, and share your favorites! Strange Customs — Still Learning! Looks like you’re ready to roll! I do this as much as possible, even if it’s just doubling a recipe I’m preparing for that night and putting half in the freezer for another time. It is defintiely easier here where I can buy frozen chicken breasts that need no prep. One of our favorites is just boneless skinless chicken breasts with taco seasoning. You can use premade seasoning (1/4c. or one packet per lb or meat) or make your own mix of spices. Just dump it all in the crockpot, then we serve it over rice with cheese, salsa, etc. It just slow cooks all day and then shreds into yumminess. Another fave is just chicken breasts with bottled BBQ sauce. Don’t know if you have options there, but there are lots of easy homemade BBQ sauces out there. You can serve this shredded on rolls, or just as a main entree. Okay, that was a super long comment. I’ll have to check out your recipes now! Thanks for linking to our recipes!